Lindsey is from Indiana, and Liam is from Australia. So when they started planning their wedding celebration Kauai was the perfect fit. A tropical paradise destination that’s halfway between their hometowns, it’s no wonder their wedding guest count was close to 60. And their wedding weekend? It was the ideal Hawaiian celebration—relaxing, fun, and beautiful. The day took place at the Waimea Plantation Cottages. Hidden on the quiet sunny west side of the island, the beachfront cottages have an authentic laid back feel. The wedding day began with mimosas for Lindsey and local craft brews for Liam. And since they opted to skip a first look Lindsey and Liam spent the morning relaxing and getting ready. 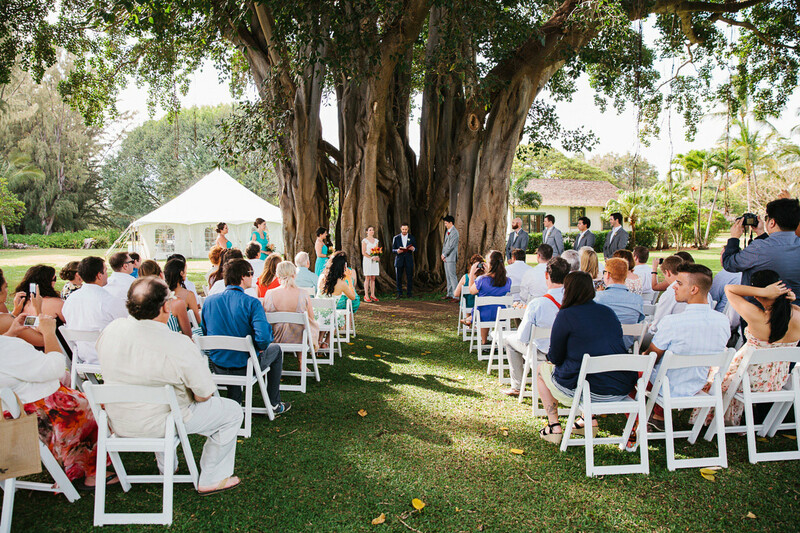 The ceremony took place under a massive banyan tree, and the vows were sweet, thoughtful and funny. While the guests enjoyed cocktail hour Lindsey, Liam and I snuck off for portraits, bridal party and family photos. Following dinner the reception kicked off with entertaining toasts from the bridal party. The night wrapped up with dancing, a hora to Gogol Bordello, sparklers, and a bonfire. If you’d like to see more from this awesome Hawaiian wedding make sure to check out Lindsey and Liam’s engagement session! This in-depth wedding coverage gallery shows around one third of the 400-600 final images delivered to the client. Ready to Love Your Wedding Photos?